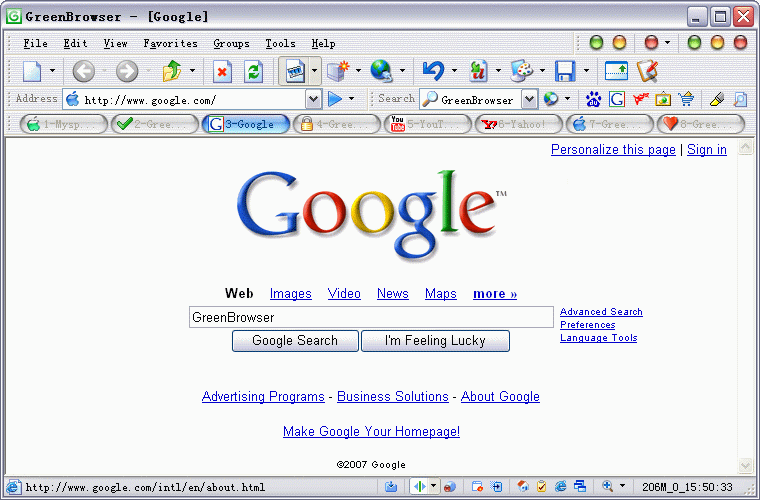 GreenBrowser is tabbed web browser with a variety of built-in features including Collector, Mouse Gesture, Mouse Drag, Ad Filter, Search Engine, Background Color, Toolbar Skin, Proxy, Tab Bar, Quick Key, Auto Scroll, Auto Save, Auto Fill Form, Auto Hide, Start Mode, Link List Analyze, Group, Status Bar Display, Special Download Control, Search Bar, External Toolbar, Run Script, Download Manager, Page Zoom etc. The program is based on the Internet Explorer engine (Trident). Add: text color of unread tab. Improve: mute function under Windows 7. Bug of mistakenly close page. agree with tttt1111, i wont use a browser (or an AV) from mainland China. @ fullbug: Downloaded the app today without problems. BTW: In case you meant the application ... tried out as well ... no problem. @ fullbug: Website/Download works, but the connection is extremely slow presently. It worked without problems yesterday. I think it's only a temporary problem. What makes you think I'm a yank? And I *was* talking about the US. To the TPFC moderators: I would have sent that as a PM but your site isn't letting me. @ttttt11111: any more than one would about living in the 'States'? Note: I don't usually indulge in 'flame baiting' but your comment on China was too rich to pass. Sorry. greenbrowser is made in China. Who knows what sort of spyware is in it, what sort of data collection (e.g. credit card numbers) it transmits back to Beijing? Feel free to use it if you have no concern about living in a police state - or being monitored by a police state. Doesn't have all the bells and whistles of Opera or FF, but it's faster than IE and with better features. A good basic browser that's light on resources. @ BGM - portable apps are slow, if run from a CD. Considerably faster if run from a USB stick. For the best performance, copy the executable to hard drive. Stick it into your documents folder or someplace out of the way, and fire it up from there. Your hard drive will almost always be faster than either CD or USB. I'll be happy when the dominance of IE is broken for good. I'm tired of having to adapt to HTML and CSS that it either misinterprets badly, or ignores completely. I suppose cleaning up the junky interface is a good start though. Hello all! At our place we have only one computer room for internet access, so the whole staff shares the internet computers. I have been looking for a portable browser to use on my USB key, but I have found that the portable browser such as Opera and FireFox run much too slowly to be used with any comfort. Pocket K-meleon is also slow and crashes in Vista. But GreenBrowser is very fast because it uses IE. True, it is almost Maxthon! There are so many great features in GB and I will continue to try it out. It does lack an RSS feed reader, and has few plugins, and I cannot seem to get links to open in the current tab. But what is really great in a portable browser are the customizable toolbar buttons to open external (via relative paths!!) programs on your USB key. You can also set its default favourites folder to either the ones used by IE OR (did I say *OR*?) a folder of your own choice on your USB key. The favourites work exactly the same way. I like GB. Thumbs up, and thanks! This sounds very much like the Maxthon2 browser I have been trying out, also using the IE engine. Portable Greenbrowser modified the registry and hijacked the all default browser functions for http, ftp, etc and offered no option to restore default. In order to fix, I had to delete all registry keys with a value of "greenbrowser.exe", run IE, set it to the default browser and then run "Set Program Access and Default" and reset it to my preferred browser. I fully deleted GreenBrowser from my USB drive as I do not want the host computer's default browser settings tampered with "ever". "Greenbrowser has more features than IE and Firefox"
Greenbrowser in no way has more features than Firefox, no way. With extensions Firefox can do WAY WAY more than Greenbrowser. This one is my FAVORITE one! I use a lot the Mouse drag options, IE and Firefox don't have these features. Greenbrowser has more features than IE and Firefox. This application seems to want to write to the Registry (according to my firewall). Evidently I have blocked the request, but does this not limit its portability? Using IE7 makes absolutely no different to GreenBrowser whatsoever in terms of layout. Greenbrowser is ONLY using the rendering engine of Internet Explorer to construct HTML pages. Greenbrowser is a fantastic IE based browser and one of the choices if you insist on using IE. I used to use Avant browser but it is not portable. Furthermore, Avant didn't seem to block ads very well (of which Greenbrowser does an excellent job). My only critcism would be that since it's written by a Chinese author (I assume) some of the English translations and options are a little confusing at first, but once you have the browser configured to your liking there is absolutely no need to ever touch IE again (including version 7, and probably 8 too!). I guess what I was wondering is if/how GreenBrowser adapts to the IE7 interface change...you know since the navigation and address bar are "stuck" where they are in IE7. Though I do miss my old IE6 compact menu layout (small icons, navigation and address bar on 1 "line" (top of the screen) along width the Links "menu" to the right of the address bar (makes for a drop-down menu that way hehehe), IE7 is great. Just wasn't sure how GB would work with the change. I have been using this one for years. This is so far the best IE shell. Now I use firefox most of time, but still keep this one as some web pages still work only with IE. GreenBrowser includes a very good adblocker. Under the GreenBrowser options you can find the popup- and content filter. Does this work with IE7 too? :) I used it a couple months/year ago or so, back when I had IE6, and it really gave a "feature boost" for IE6, but IE7 is fairly "complete" (all it really needs now is adblocker :P lol).